Despite my many perambulations across the length and breadth of Spain, I have always avoided visiting Seville. This was not because I didn’t want to go there, which I emphatically did, particularly because I wanted to see the site of the 1992 Expo. I wanted to do the city more justice than a day trip while on my way to somewhere else. Serendipity tossed in a few days to kill while driving from Trujillo to Malaga, so we thought that we might as well spend them in Seville. On our arrival by car, we got thoroughly lost in the tiny alleys of the old town, a warren of one-way systems and dead ends. As we reversed out of yet another pedestrian walkway, We swiftly realised that if we indulged our usual plan to take a hop-on hop-off bus, we would miss all the interesting old parts of the city, because there was no way a bus would fit down them. 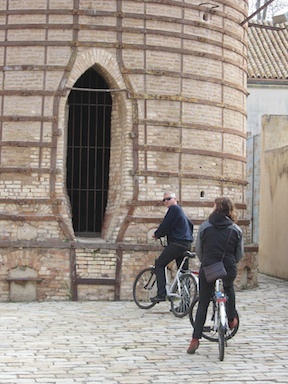 Once we eventually ditched the car in a car park that was more expensive than our city-centre hotel, we decided instead to rent a bicycle tour guide. We arrived at the bike store to discover that we were the only clients that morning. Because of this, and because “you are young and can cycle”, our guide Antonio decided that instead of simply doing the normal city tour, we would also tour some of the lesser known sights and take in the 1992 Expo. This would mean stepping up the pace a bit, but he thought that it was probably do-able. The Expo was pivotal in the formation of modern Seville. Until then, the city was a bit of a nowhere place, with no particular crop or market to distinguish it from its neighbours. In fact, through its long and chequered history, there have been periods of hundreds of years when the city didn’t exist at all, particularly after the river port silted up and all the excise business moved to Cadiz. Then Seville hosted the Expo. The government co-opted the rather beautiful premises of the local ceramics factory and issued invitations. Hundreds of countries built pavilions to showcase their wares. The French brought an Ariane rocket, the Japanese built the largest wooden structure in the world, and the Australians opened a bar. The Expo was an immense success, and kick-started Seville’s tourist industry in such a way that it never looked back. Although many of the pavilions were taken home after the festivities were over, some were left behind. One notable case was the Australian pavilion, a bar with one month’s licence which had been such a success that the owner skipped town with all the proceeds, leaving behind all his staff with no wages or tickets home. They petitioned the government, and received permission to continue operating the bar for a full year, so that they could recoup their losses. 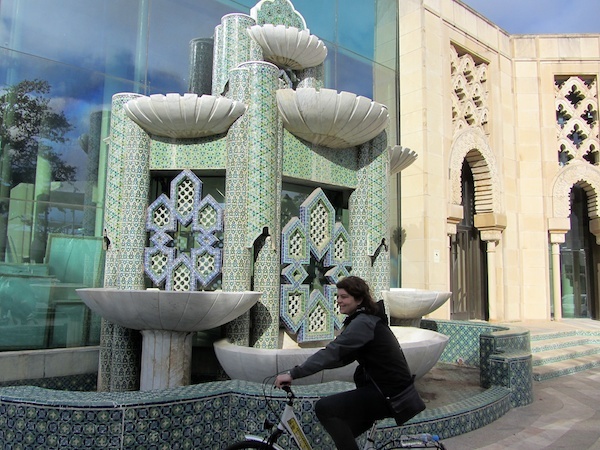 Bronwyn cycles past the Moorish Pavilion, now used as a store room. There are also some buildings dating back to the 1929 Expo, which was a showcase of all the Spanish nations, plus a couple of extra invitees such as Israel (which did not then yet exist as a country). Plaza de España is a tremendous edifice built in a mixture of styles including Mudéjar, which is a beautiful faux-Moorish architecture popular in the city. The Plaza is now largely used as government offices but the canal is a popular spot for rowing. Antonio told us that, when he was growing up, this was a good first date where you could attempt to splash water on your girl’s top to make it more transparent. Everybody we met told us that a visit to Seville was not complete without a visit to the Alcázar (Royal Palace), so we spent an afternoon poking around in it. 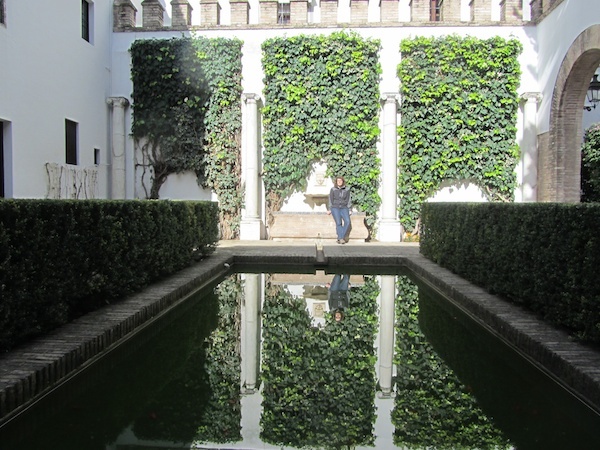 Originally a Moorish fort, the Alcázar consists of many Arab courtyards with water features and mosaic tiling, surrounded by extensive gardens. Even in winter it is quite a lovely space. Sevillians have an interesting theory about the history of their city. They maintain that it was founded by Hercules, who was a refugee from Atlantis (Tharsis) which had been flooded with sand by a tidal wave. The story goes that Hercules set up twelve trading centres around the Mediterranean, which became entangled in the Twelve Labours of legend, with the founding of Seville somehow related to cleaning out the Augean Stables. Sevillians also recognise that much of their infrastructure was implemented by Julius Caesar, and there are statues to both of these founders at one end of the Alameda de Hercules. The cathedral is sometimes touted as the largest gothic cathedral in the world. However, it was pointed out to us that (a) only a small part of the cathedral is gothic, and (b) since the Vatican is by definition the largest cathedral in the world, Seville was not allowed to consecrate the whole building. Still, it’s an impressive pile with a great tower. But what about the oranges? Seville’s name is inseparable from the orange fruit, and the trees are everywhere. However, none of them are edible. It is alleged that they were introduced during a period of Arab rule, when the pith of the sour oranges was used to provide acid for the production of gunpowder. There are plenty of tourist-trap restaurants in Seville, but by ignoring any place that was on a main street or advertised an English menu, we managed several respectable crawls of lovely little bars. We drank copious copas of good Rioja, and ate innumerable tapas of (usually) Iberian ham and cheese. The locals were always welcoming, and obviously proud of their place in their blossoming city. This entry was posted in Europe, Spain, Travel on 2014/01/28 by Reinhard. 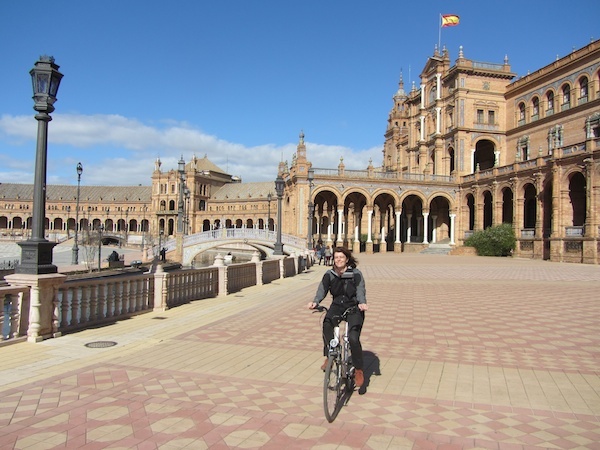 The best vehicle for Seville is the bike!! !